I would like to thank everyone who faithfully come back every week to participate in Show Your Stuff. It is hard to believe it has been over a year already. 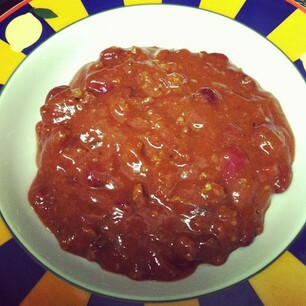 So this week I am showing off my husband's famous chili recipe. Brown ground beef and onions in 5 quart pot, using the seasoning salt while browning. Drain excess grease, add all other ingredients to browned beef, stir well, add 1 cup of hot water, mix well. Bring to a boil, reduce heat and let simmer on low heat for 2-3 hours. Serve. Yields about 1 gallon of chili. For a spicier chili add jalapenos to taste during the browning process. And your party is fun! thanks for having us bloggy people over! It's cold here and chili sounds so good right now. I like the idea of cinnamon. Thank you for hosting! I do like a good chilly, unfortunately, my wife doesn't, so we don't eat them here. Looks oh so delicious! Thanks for hosting and enjoy the rest of your day.